Second, MBOs hardly ever precisely target a company’s true priorities. They are often too fuzzy to hit any actual goal. They aren’t detailed enough, and sometime they aren’t even written down. Third, defining objectives is a labor-laden process, so it’s performed only once a year. But the pace of business today is way too rapid to lock in a program with your manufacturing manager in October and calculate his reward fourteen or so months later. You need a specific process that targets your corporation’s top priorities in detail. The process must be easy, it must generate intelligence and improvements through constant review, and the execution must challenge the organization. During my career as a turnaround CEO, I’ve developed a fourth generation of MBOs that meets all these criteria. The process is described in the publications over the next three weeks. 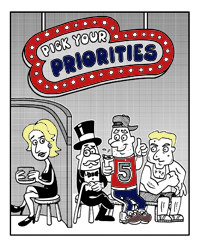 Rigorously followed, this fourth-generation Pick Your Priorities approach will have your company spearing the target every time.